Twitter has started to use Google’s SPDY protocol for handling web requests from browsers that understand the speedier alternative to HTTP. Google and its services already use SPDY by default. If you just upgraded to the spanking new Ubuntu 12.04 aka Precise Pangolin, then you’ll have Firefox 11 installed by default which also has SPDY support now. 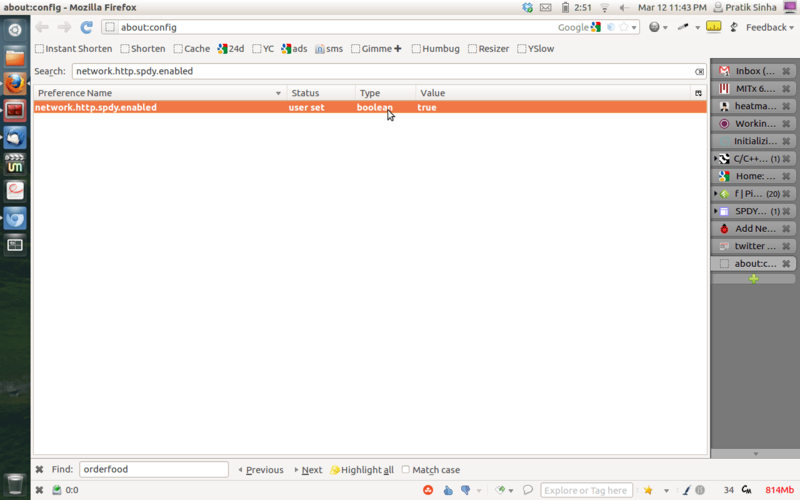 To enable SPDY in firefox, type about:config in your location bar and press enter. Now enter network.http.spdy.enabled in the search box. Double click the entry corresponding to network.http.spdy.enabled to enable it.